← Fix for broken tabs on He-Man figure type armor. 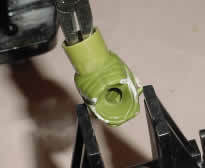 What do you do if your Kobra Kahn sprayer stops working? Your Kobra Khan figure’s head no longer squirts right, so what do you do? 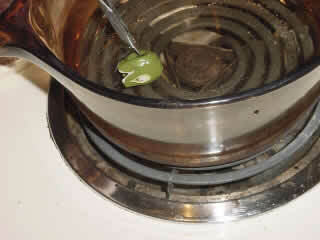 Pull the head off and boil it in water to soften the rubber. During the next step be careful so as not to damage the head. You don’t want to leave any unsightly marks on you toy’s head. 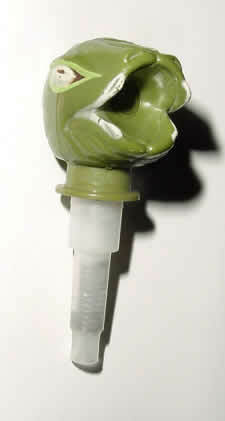 Find a spray bottle top that matches the size of the hole in the figure’s head; the color is not that important. I happen to like the blue one for a change. If you want, you can go to the store and search for a green one. Insert the new bottle top into the head. You may have to reheat the head in the boiling water in order to get the spray bottle top to fit inside the action figure’s head. 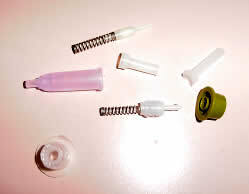 Break apart the parts that go to the squirt assembly for both Kobra Khan and the spray bottle you chose. Keep the parts separate so you know which one goes with which assembly. 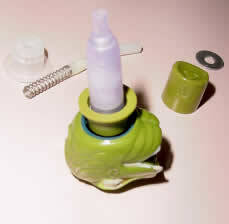 Rebuild the squirt assembly with the parts that are not broken. Make sure they all work together. You must use the original green piece from Kobra Khan. 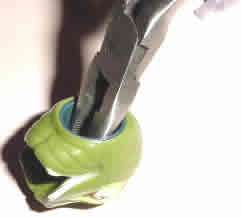 Insert the new squirt assembly back into the head. Test it out make sure it works. If it does not work, pull it back apart and rebuild it. If everything works OK, then put Kobra Khan’s head back on and have fun misting the heroic Masters of the Universe. 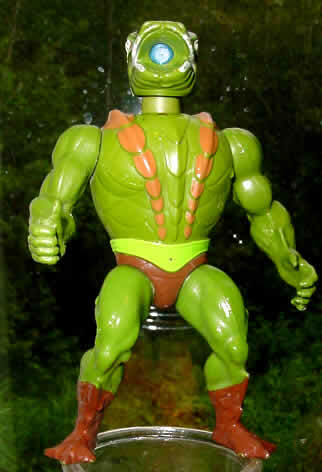 This entry was posted in He-Man type figure fixes. Bookmark the permalink.